The burning question in the vineyard business these days is whether or not to rip out and replant Red Blotch infected vines. On the one hand, the first variant of the disease has spread at an average of maybe 4% per year at the UCD Oakville station. This might be a rate of spread that is manageable now that we are dialed into the symptoms. On the other hand, a second variant of the disease has seemingly invaded the Oakville station from a different direction and general symptoms have spread to very nearly 100% of vineyards in Napa, Sonoma, and Mendocino counties within the last few years. The best estimates of the latency period between infection and symptoms is 1-2 years. The average rate of vineyard replanting in Napa and Sonoma is on the order of 5%. In the seven years since GRBaV was first noticed, we might expect that 35% of the vineyards have been replanted. 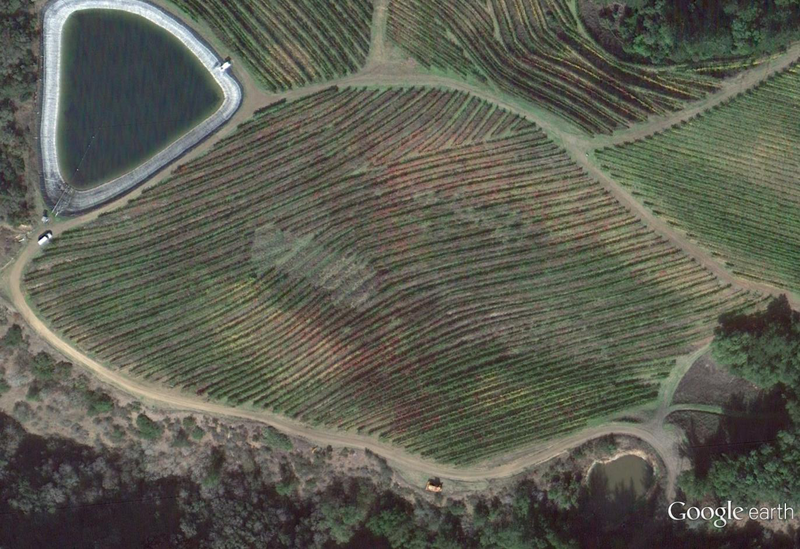 All of these vineyards could potentially have been replanted infected. An equal number of additional vineyards infected by transmission from neighboring vineyards at the internal vineyard rate might bring the expected total to an aggregate 70% of vineyards possibly infected by planting and transmission since 2008. Yet if we accept the two year latency, no vines planted or vector infected this last year should be symptomatic yet. This would reduce the expected aggregate infection since 2008 to 60%. Turning this analysis on it’s head, to reach the 100% infection of vineyards observed, it would be necessary to postulate that for four years prior to 2008 beginning in 2004 the same rates of infected planting and transmission to an aggregate infection of 40% of vineyards by 2008 went unnoticed. Oakville station is a very small sample size and it is possible that internal rate of spread there is not representative. Yet this low rate is roughly consistent with the rate observed in a completely isolated vineyard an order of magnitude larger. An alternate possibility is that the virus spreads more efficiently between vineyards than within. This possibility could explain edge/road effects. The vector would prefer the dust and turbulence of frequently travelled roads to the intermittent passage of machinery and workers within the rows. Then again, it could prefer ambient vegetation to vines and be a reluctant invader. The edge/road effect is pretty ironclad, but what does it really mean? If it means that a vector is established in ambient vegetation or an adjacent vineyard or block and efficiently colonizes the edge of a new vineyard or another block, why would it spread less efficiently within the new vineyard or block? The Napa valley is essentially grape monoculture, one giant vineyard. The areas of ambient vegetation are limited to the perimeter of the valley, a few creeks and volcanic knobs, and landscaping. If this is what is meant by edge we should see a pattern of infection emanating from theses areas. This is not what we see. We see a pattern of infection along roads throughout the monoculture. 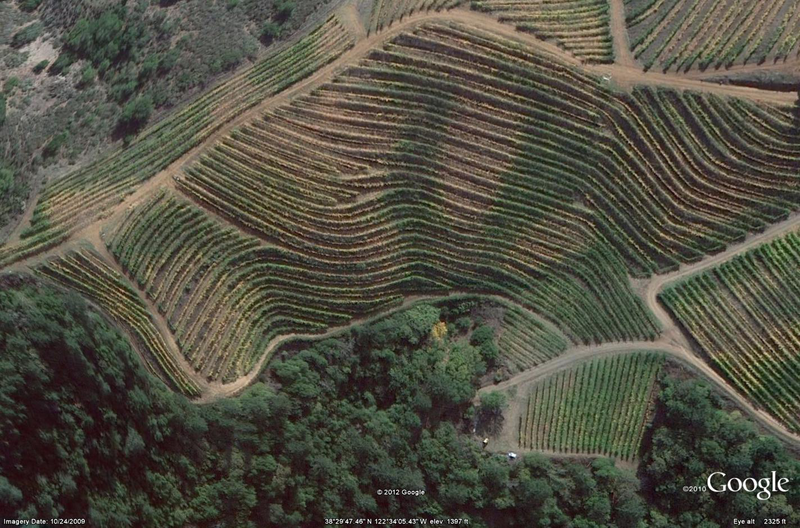 The very existence of this road pattern within individual vineyards and within the monoculture as a whole suggests that there is more going on than a monotonic internal rate of spread. The following is the pattern of grossly infected vines in autumn 2014 in an isolated vineyard. An isolated vineyard can be thought of as a microcosm for Napa or Sonoma valley monoculture. 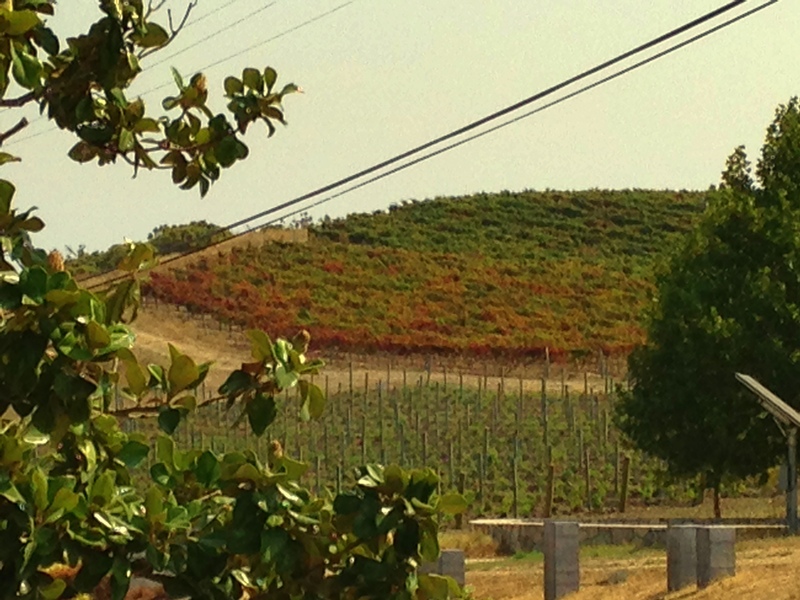 The red vines are defined as grossly symptomatic with more than 50% red canopy. The blue vines are missing in action and undoubtedly victims of trunk diseases and landslides. There are a few yellow vines shown that are really red but convey misinformation because they were transplanted or budded over. There are three rootstocks. The light grey is 44-53, the darker grey is 99R, and the black is 1103P. A quick take is that the 44-53 is wildly symptomatic. I have written this but I hereby repent. A more careful analysis reveals that the combination of 44-53 rootstock and the CS337 clone best explains the disparity in distribution. The vineyard provides a way to separate the variables. Most of the 44-53 rootstock was grafted with CS337, but not all. When the data is sorted by rootstock it becomes clear that when the 44-53 is paired with CS 4 there is a drastically reduced rate of gross symptoms. When the data is sorted by clone it is apparent that it is not just the clone either because when the 337 clone is paired with 1103P rootstock the gross symptom rate also drops off dramatically. The 44-53 and 337 seems an unhappy pairing. The image above is cropped to highlight the extent of the 44-53/337 in the vineyard. There are two areas divided by a heavily forested area and a 300′ ravine. To our eyes they are different animals. In the tradition of phylogenetics and population biology we conclude that the upper area with 34% average gross symptoms is the original source of infection. This area also shows far less edge concentration. In contrast, the lower area shows striking edge concentration. The image above is of the upper portion in 2009, the image below of the lower portion swung around to a similar view attitude on the same date. 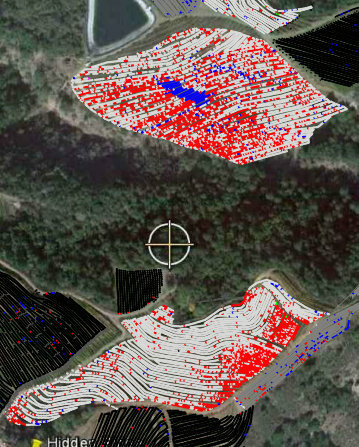 While the reservoir side clearly shows red leaf symptoms in October 2009, the other side does not. It should be noted that the 28 qPCR assays we have done so far of symptomatic vines have all been positive for GRBaV and RSPaV but negative for all other viruses tested. We also performed two phytoplasma assays which were negative. We know so little about this virus that is premature to jump to grand conclusions, but our evidence suggests that the virus spread from the reservoir side to the other side of the ravine along the roads. The notion of road dispersal is further reinforced by observations of roadside infection of wild grapes and even cultivated grapes overhanging St Helena/Spring Mountain Road. While this road effect is by no means certain, the possibility that it is real is a very important factor in any decision to replant a vineyard. If the new vineyard cannot be protected from reinfection, the effort is pointless. As much as we would love to believe that the distribution of GRBaV follows from grafted heredity, our information suggests that the environment is a very important factor as well. 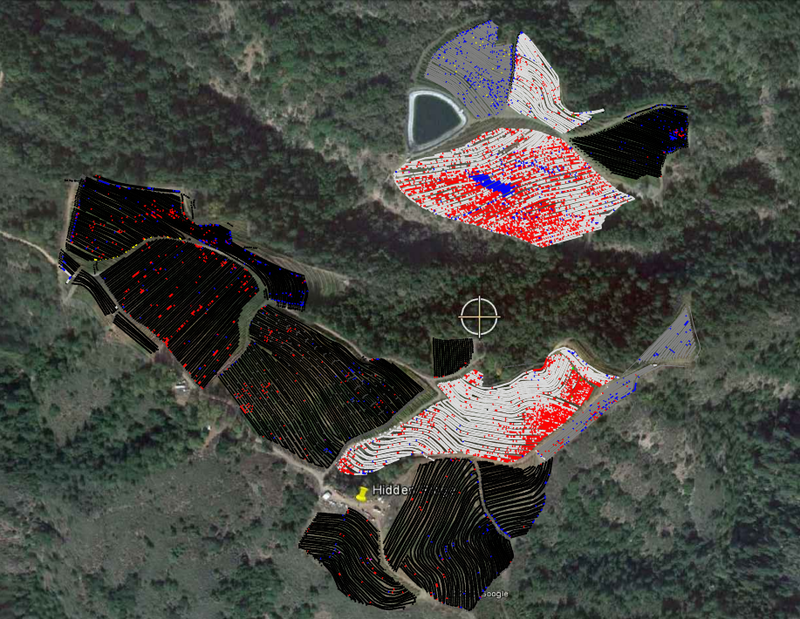 This entry was posted in Biology, GRBaV, Red Blotch Disease, Wine and tagged Road Effect. Bookmark the permalink.